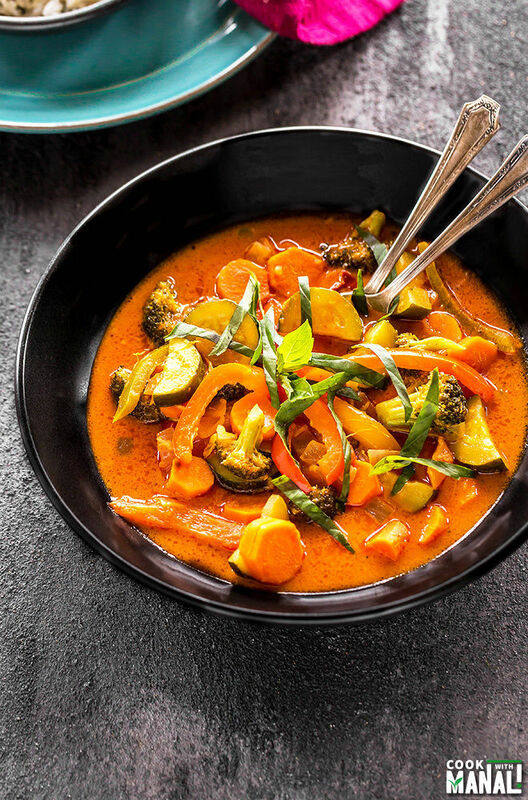 Vegetarian Thai Red Curry – spicy and flavorful thai red curry loaded with veggies. Easy dinner ready in 30 minutes! Oh how I wish there were like 50 hours in a day because 24 are just not enough. My list of “things to do” is at an all time high and it looks like it’s never going to end. That’s what happens when you are away from home for more than 2 months! This weekend all we did was grocery shopping, oh so much of it! You guys know it’s so funny but I shop from at least 3-4 grocery store for different stuff. It’s like I need to go to Costco to get the flour or sugar in bulk but then I also need to go to Trader Joe’s to get my veggies and fruits. And let’s not forget the Indian grocery store. After all I am an Indian and I need my Indian grocery too. Do you guys do that too? It surely takes a lot of time! Because we had so much work over the weekend, we ended up eating out on both days. I really don’t want to eat out so much but more often that not that’s the story of every weekend. One of our meals was at our favorite Thai restaurants in the city. I won’t say Thai food is my favorite, I sure like it but it’s not at the top for me. But this place, their food is delicious. 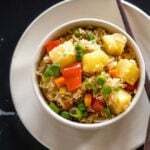 I love their pineapple fried rice and the vegetarian thai red curry. 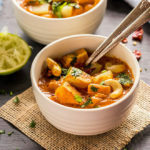 Of all that I have tasted, the thai red curry is my favorite and I often make it at home since it’s a really easy one pot meal which doesn’t take much time to put together. The main ingredients of the thai red curry is of course the thai red curry paste. 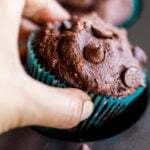 Now you can make it at home, it sure will taste so much better than store bought but it will take some time and also there a lot of ingredients involved so some extra time for grocery shopping too. I like to use this “Thai Kitchen” red curry paste, which is readily available at most grocery stores. 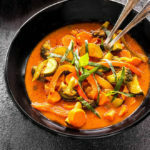 I think it tastes great and makes the whole process of making thai red curry at home so much easier and hassle free. 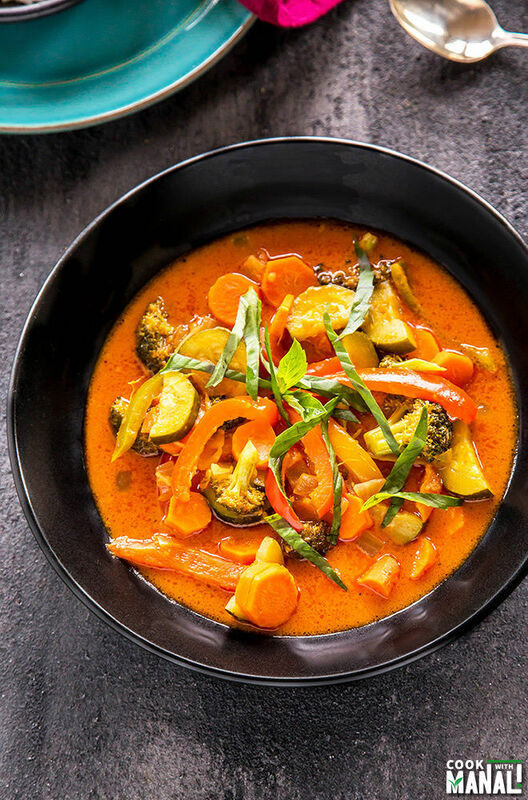 You guys know how much I love my veggies so this vegetarian thai red curry is a great opportunity for me to go overboard with veggies! For this recipe I have used pepper, carrot, zucchini and broccoli. You can use other veggies too like mushroom, snap peas etc. It’s totally a personal preference. I would have definitely added mushrooms if not for my hubby! I think with most Asian recipes, it’s the prep work that takes more time. Once you have everything chopped and ready to go, it’s all really easy and comes together quickly. Thai food is usually spicy but I cannot handle a lot of spice, so this vegetarian thai red curry is mildly spiced. Please feel free to make it spicier! 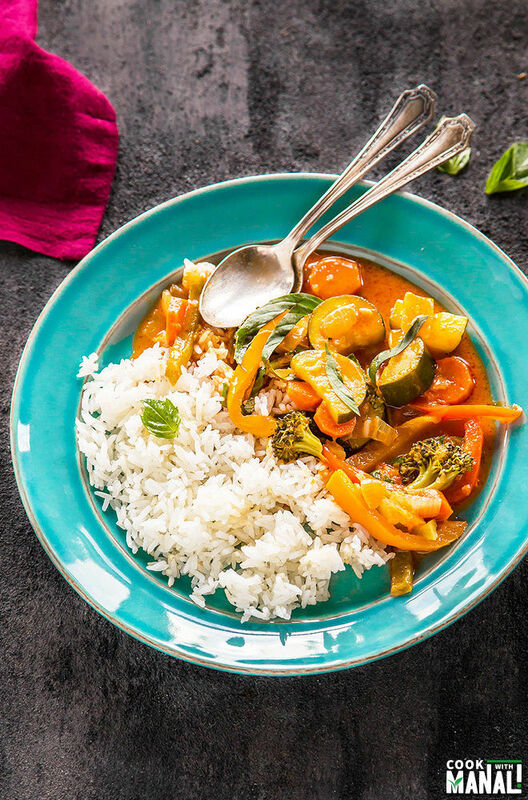 This vegetarian thai red curry is an easy dinner idea and takes 30 minutes to put together. Just what you need for those busy days! I have also included a quick video to show how easy it really is! * Be careful of the thai red curry paste that you pick. Not all of then are vegetarian and vegan friendly, so it’s a good idea to check the ingredients list. I recommend using “Thai Kitchen Red Curry Paste”, which is vegan. 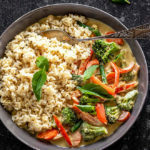 Vegetarian Thai Red Curry - easy one pot meal which gets done with in 30 minutes! 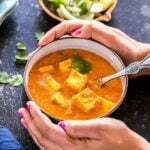 In a bowl mix together coconut milk with thai red curry paste and set aside. Once hot add dried red chilies and saute for few seconds. Then add chopped onion and cook till they are soft and translucent, around 4-5 minutes. Add ginger and garlic and cook for 30 seconds until you get a nice aroma. Now add the veggies - add carrots, zucchini and mix. Then add broccoli and the peppers and stir to combine. Cook for a minute, then add salt and water. Cook the veggies for 3 more minutes and then add the thai red curry paste & coconut milk mix into the pan. Add coconut sugar, turmeric powder and mix. Also add sriracha and rice vinegar and mix. Bring the mixture to a simmer on medium-low heat and cook the veggies for 5-7 minutes or till they have softened. Stir occasionally. Remove pan from heat and add soy sauce (if using). Squeeze in fresh lime juice. 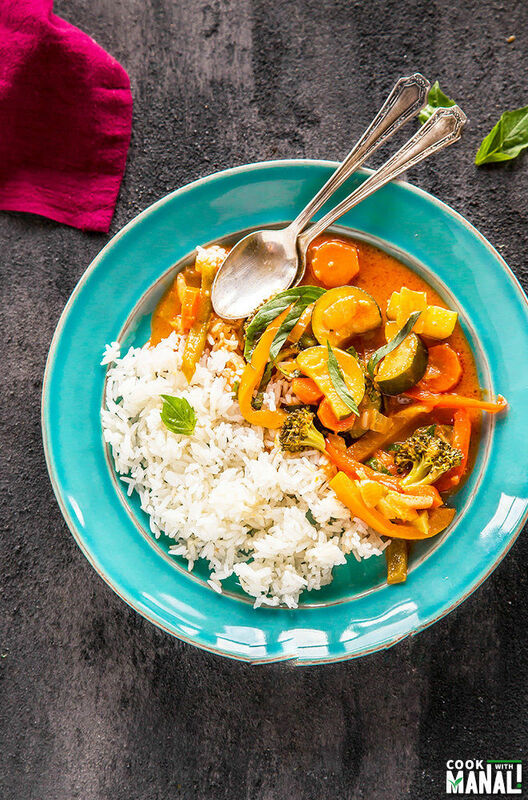 Garnish with basil and serve vegetarian thai red curry with jasmine rice. I definitely shop at one too many grocery stores too…sometimes it’s fun, sometimes not so much! This curry looks gorgeous, Manali! I love the pretty color and flavor, perfect for dinner! I agree, sometimes it’s not fun especially when you are tired! 🙁 Thanks Gayle! I LOVE a good curry, but I’ve never had a red curry before! 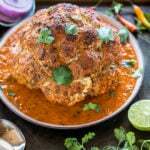 This looks like the perfect weeknight meal, Manali! You need to try one! it’s amazing! Oh man, I can only imagine the time it took to get the house back up and running after being away for so long! But if this Thai Red Curry was waiting on you at home, I bet those errands would have been done a lot faster. 🙂 Laura make a similar dish, and it’s always a huge hit here! It’s a task David! But I am getting there slowly. 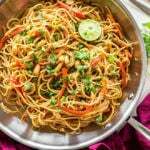 I had curry in Cambodia for the first time and it CHANGED MY LIFE!!! 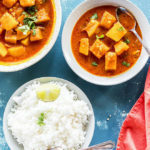 This curry looks great! Nice video too! It’s the thai red curry paste and it is mentioned in the ingredient list! Which Thai curry paste you used? Hi Shilpa, it’s mentioned in the recipe..I used Thai Kitchen red curry paste which is vegan.